The principle of the seeder's functioning is based on the rotation of the sowing hub. The brush stopper leaves in every deepening of sowing hub one seed or few (depending on its regulation) which is thrown down into the furrow by the flip-out ejector of original construction. 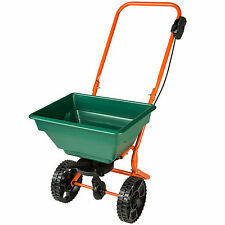 Professional rotary spreader lawn fertiliser walk behind grass seed or weed feed or grit spreader. This products is ideal for dispersing a variety of grass seeds granules and during the winter season fine grit. Attrezzo per seminare semi, bulbi o trapiantare piantine con panetto di terra. Lavoro preciso e confortevole, non dovrai più restare chinato per ore. The seeder consists of 5 sowing machines with seeder silos SMK-1, planted on a common shaft. The sowing inserts of the SMK-1 and SMK-5 seeders have a similar design and purpose, but are not interchangeable due to the different step of the seed pits. Lavoro preciso e confortevole, non dovrai più restare chinato per ore. Salva la tua schiena! Attrezzo per seminare bulbi o trapiantare piantine con panetto di terra. The Rapitest Mini Seed Master is designed to ease your planting of small seeds, help eliminate thinning that is caused from over seeding. RAPICLIP MINI SEED MASTER. Order Request. The seeder consists of the body of the sowing apparatus, on which is fixed a seed bin, a shaft with a sowing bush and drive wheels. Attached to the bunker handle for cuttings. Garden Precision Seeder. Use with Scotts Lawn Builder, Evergreen and Miracle-Gro granular lawn care and/or grass seed products only. Variable settings to apply lawn food or grass seed. Adjustable handle bar for comfortable use and storage. For even application of granular lawn care and grass seed. Arm support for greater comfort. Supplied in trays of 4. Sämaschine mit Dosierlöffel und Säscheiben. Säscheiben mit 13 unterschiedlichen Lochgrößen. Anzeichnen der nächsten Saatreihe. Sämaschine ist sehr einfach zu installieren und zu betreiben, ist es leicht zu montieren und demontieren, was ihre Lagerung vereinfacht. If you have expensive seeds, and you need to strictly observe the seeding rate. Refers to the type of exact seeding. Manual Planter sowing small seeds. Number of sections in a row 4. Row width, cm 6-12. (Vedi uso e manutenzione allegato). La regolazione della quantitá di semina è molto importante per la buona riuscita della semina stessa. Il dosaggio della quantita di semi deve essere continua e costante. Manual Planter Transplanter Garlic Onion. Cassette seedlings with the help of this device sits on a convenient and technologically accurate depth in the soil, in which there is no need to dig holes in advance for planting. GARDEN SEEDER by "EARTHWAY" Free Shipping in USA, Reasonable Worldwide Rates! “EarthWay” PRODUCTS, INC. GARDEN SEEDER. Seeder opens the soil, spaces. THE PRECISION SEEDER ELIMINATES. plants and covers the seed. 6 SEED PLATES INCLUDED. ~~FREE SEED SAMPLER INCLUDED~~. IN ONE CONTINUOUS OPERATION. Anwendung Gleichmässig und schnell streuen von Dünger, Salz, Samen etc. Ideal einsetzbar für Hausgärten, Rasenflächen, Vorplätze, Treppen Flächig oder punktförmig, auch für unregelmässige und verwinkelte Flächen oder Ecken Einsatz im Sommer und Winter . 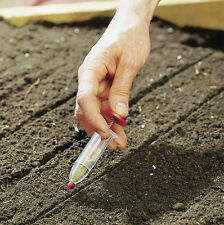 Even the tiniest seeds can be sown with precision. The Seedmaster has 4 different baffles so you can insert the one that fits your seeds. Kreator Streuwagen Düngerstreuer Sandstreuer 12 Liter Salzstreuer Saatgutstreuer. - 1x Streuwagen (12 Liter). Sollten Sie andere Wünsche haben, so lassen Sie es uns wissen. BERUF I HAUS I GARTEN I FREIZEIT. Aussaathilfe Magic Seeder. praktische Aussaathilfe. ideal zur Einzelkornaussaat. kein verschmutzes Saatgut. Die pure Lust amGärtnern verbindet, der Duft der Kräuter überwältigt. Kräuterschilder für Innen. Manici Pratici e comodi. Regolazione della profondita della semina: con l’utilizzo dello scivolo si puo regolare la profondita della semina ( 0-7 cm). (Vedi uso e manutenzione allegato). La regolazione della quantitá di semina è molto importante per la buona riuscita della semina stessa. Der Streuwagen L ist aus korrosions- und witterungsbeständigem Material gefertigt und kann leicht mit Wasser gereinigt werden. Marke: Gardena |. Ihre Vorteile als Kunde von CBdirekt. Vom Industriekunden und Handwerker, bis zum Heimwerker ! Attrezzo artigianale per seminare bulbi o trapiantare piantine senza sforzo e senza danneggiare la schiena. Use the Scotts WIZZ Spreader year-round. Whether you use it to spread grass seed or to fertilize the grass seed, it will evenly spread the product with minimal work. The battery powered motor will move the material out to the front. The EverGreen Easy Spreader Plus is ideal for applying EverGreen granular lawn products and seed to your lawn. The Easy Spreader Plus has a convenient on and off switch for safe turn around, and adjustable settings to ensure the correct application rate for the product. (Now even the smallest seeds can now be placed with ease and without waste. RAPICLIP MINI SEED DIAL SOWER / PLANTER. 1) Pour the seeds into the seed well. Order Request. For convenient manual drive, two high handles are attached to the body. The seeder receives the drive through a chain drive from the front wheel. When the drill moves in the sowing apparatus (in the hopper), the brushes rotate, which direct the seeds to the seminal duct. 45cm Spreading width. 12 Litre capacity. 20cm Wheels. Double push bar. Adjustable spreading lever. House made of impact-resistant plastic. Corrosion-resistant roller. Drop spreader allows accurate application. 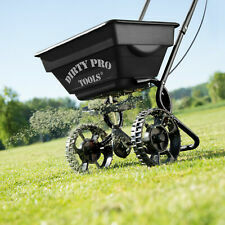 Designed for the easy application of lawn products and grass seed. Easy to assemble. Gear Ratio: 5:1. Greaseable stainless steel axle, impeller shaft, and on/off assembly for extended wear. Adjustable handles with 3 positions that adjust to users of all sizes. SCOTTS WIZZ. You are viewing Scotts Wizz Hand-Held Year-Round Spreader. This nifty, and light weight gadget makes working in the yard so much easier! Step 2- Fill: Wizz is designed to hold enough product to cover 2500 sq ft.
Seeder / Row Crop Planter. Good used condition. Maximize your efforts. These are necessary to move things along as quickly as possible. I resolve issues fairly and quickly. Use in tilled soil. Plastic Screening Mesh for Large WTB Walk Behind Spreader NB. This is new old stock. It may have some dust and dirt on it from storage and handling but it is a new unused item. THIS WOULD BE A GREAT PROP OR DISPLAY ITEM. Von Siena Garden. Farbe(n): Schwarz.